The idea of reverse engineering itself carries the idea of re-engineering an existing physical component – one that has worn out and needs replacement but the spares aren’t available. At such occurrences, existing worn out parts are scanned using portable 3d scanners and lasers which are later imported to CAD software. These 3D scans are then converted to 3D solid CAD models for further design optimization and finally re-manufacturing. A step by step dismantling of the part is done and each geometric measurement is recorded and 3D physical part is redeveloped using SolidWorks and Geomagic X designs for generating final 3D CAD models. Once the 3D model is designed and reengineered, the design engineer extracts fabrication drawings from it, and shares with the manufacturing company or the OEM (Original Equipment Manufacturer) for re-production. Reverse engineering services helps re-creating the parts which have gone extinct even with OEMs and such are very crucial in industries like oil and gas, industrial machinery etc. It is so because these parts have been designed long back, maybe pre-digital CAD designing era. Thus, by converting 3D scans to 3D CAD drawings and models, the part geometry is recreated and value engineering can be input easily. It saves time and resources for the engineers as well as manufacturers in recreating the parts with accuracy. This service requires also involves extensive drafting, modeling and engineering detailing tasks to endure the results. An expert CAD drafting and modeling is the right choice to attain the wanted results with CAD drafting. Reverse engineering is able to identify assembly, sub-assembly and components’ geometry, their mating and operational functionalities with detailed engineering needs. Be it automotive or industrial component manufacturing, reverse engineering has a significant role to play. Entire part geometry is recreated and the designs can be digitized as well as upgraded with reverse engineering as the cloud scan of the physical part can trace the actual geometry. 3D scanning and CAD modeling highly beneficial in reducing time to market a new product or compare the competitor’s product by using recent technology advancements. It can capture the design intelligence by scanning and designs can be obtained in digital form on CAD software like SolidWorks. Solid CAD models developed by scanning the physical part serves as the basis for re-designing, value engineering, prototype for simulation, and obtain proof of design concepts and 3D printing, rapid tooling which reduces the costs of reengineering and testing. Design engineers can work quickly with the readily available scans and CAD drafters within no time will deliver final drafting for fabrication drawings and shop drawings. In case of plant reverse engineering, equipment across the plant can be pinpointed, P&IDs, FEED etc. are made available quickly. A detailed drafting and designing with technical drawings, BOMs, part list, assembly drawings etc. is made available that facilitates inherent accuracy in the drawings and CAD files. Process of reverse engineering saves time and overall costs of the project since all the design tests are done way before manufacturing; there are very few chances of ECO or reworks. A roadway to attain excellent insights for product comparison, product feature enhancement, or test the product on pilot bases before launching it into the markets is established for the manufacturing companies. 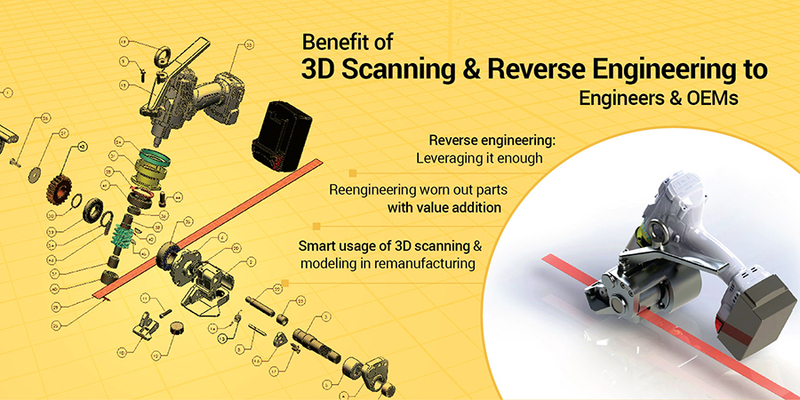 Reverse engineering delivers end to end process from designing, testing, design analysis, optimization, redesigning and manufacturing with proof with 2D and 3D drawings of various equipment, parts and components. With scanning, modeling and manufacturing, a seamless communication channel is drawn between the design engineer, manufacturer, and the OEMs, contractors, consultants and everyone associated with the product design and development. Reverse engineering accompanied with rapid prototyping is an affordable alternative to physically manufacturing the part and testing it with Destructive testing methods, like crushing tests or hardness tests. Prototypes developed in the process can also be used along with APIs of SolidWorks to develop NS machine codes to automatically manufacture the part once it is fed to the machine. The laser based scanning helps the design engineer record accurate geometry, inner surfaces and dimensions which are otherwise non-reachable, and curvature of which are never accurately measured with a Coordinate Measuring machine (CMM). The final quality of the product exceeds or at the least will match the quality of existing part which ensures that the efficiency of the new part remains same or increases in any case. If you are a design engineer, plant owner, or an OEM who is looking to explore the reverse engineering benefits, go for it now. There is absolutely no way it can harm your business. Jaydeep Chauhan is an Engineering Specialist working at CAD Outsourcing Services. He caters critical engineering challenges with ease and performs exhaustive procedures to develop robust, well-engineered and high-performance designs. He can always be found in the lab discussing, brainstorming and tweaking designs.